I’m a fan and get a chuckle now and then to boot! Love that southern accent! 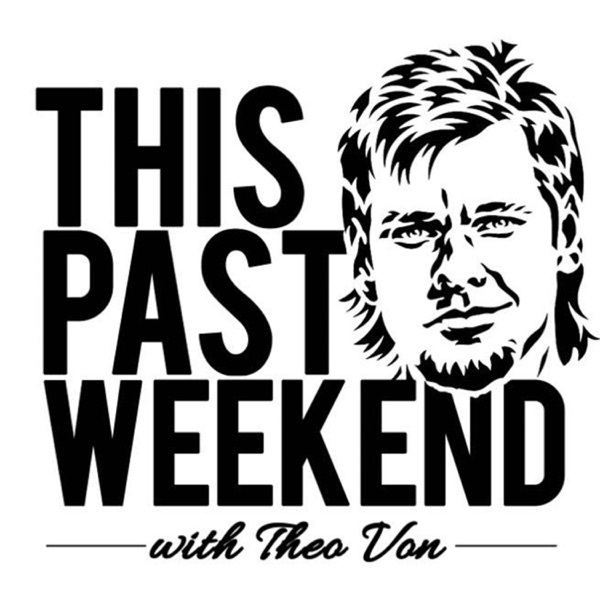 The best thing to happen to the podcast community is Theo Von, enough said. You have been a big motivation to do better for myself thank you for that and being hilarious! Thank you for making me laugh, your stand ups are awesome, your voice, presence and life experiences make me want to listen more, you make me laugh at work all day, trust me I need it 😂 don’t stop being you man, keep it up, thank you. David perlmutter and Theo killin it! Join our gang, cure your retardation! After listening to countless hours of This Past Weekend, I’m thoroughly convinced Jesus Christ had a mullet just like Theo’s. True story: my neighbor listened to just one episode and it actually cured his severe intellectual disability. He now makes robotic George Foreman grills that also tie your shoes and is grossing $3 million a year, all thanks to this podcast. They need an animated series of state wars with Callen and Theo. Keep up the great work! I don’t know how to sum up Theo. I started watching videos with Theo 2 days ago and my life has been surrounded by his comedy, laughs, and companionship he exudes with everything he does. Smart man, listen to him speaking is very calming, eye opening, and funny. When you combine real life, comedy, and philosophical thoughts like Theo does - you find a comfortable place as a listener to just listen and enjoy. Well done Theo - looking very forward to your career. Love your work. Dude keep on doing what you do! Been a comedy fan for a LONG time and your are an original my dude. Greeting from Maine. Come to Portland and do some shows!! GANG GANG!! This guy's brain is as funny as his heart is big. (He's got a huge heart and makes me gut laugh) Theo gives the best advice and is wide open when it comes to his own troubles. Nothing is off limits. I am sober and glean great nuggets of wisdom from Theo's vulnerability and insights about his sobriety. Which, BTW, are helpful whether you're sober or not. He is also not your average interviewer...he definitely asks questions you wouldn't have thought of and if you did you would've been too embarrassed to ask. There's NOTHING average about Theo or This Past Weekend! Great podcast!! Sending love from Louisiana!! Comic genius. Original. High level comedy and creative soul. Brings you in and keeps you attached. Good man indeed. Always doing his best. Gang Gang. Doesn’t break a sweat ! Favorite comedian, doesn’t have to try to be funny ! As Theo’s First and only original Manager I can speak with some authority. I worked with this southern gentleman when he was a mere Road Rules MTV Guy. To go from that to a formidable comic is some feet. Theo has washed away the reality TV days. He’s a way better comic than Joe Rogan, who isn’t particularly funny, and Theo is so much smarter. It’s that he doesn’t realize it that I think keeps him growing. Watch! Dude is so honest and open and obviously hilarious. Theo wants only to help others on his way up, and his ascent is much deserved. Please keep it up! I’m seeing you March 24 in San Jose, so thanks for adding that Sunday show. Hands down a must for podcast listeners! I’ve never had such an emotional attachment to a podcast until now. Theo, way to be, man. Love this podcast. Theo is hilarious! He makes you feel like you are really a part of his family, hes just a really genunine dude. You will laugh REALLY hard during this podcast, its all around fantastic! Honest, genuine, fearless. Great listen! This guy is something else. He’s a joker and a prankster and someone with wisdom. I was down one day and I decided to listen to Theos podcast after I’ve heard him on JRE a couple times. I wasn’t ready for the pick me up. You don’t read this but thanks Theo you gave me purpose and the kind word I needed. Gang gang! Just laughs with Theo. Subscribe and add him to your circle of friends and your daily life - maybe not daily, maybe just a few sips on the weekends for some if that’s all you can handle. It’s amaze ballz like you really need to listen to it! Theo is the funniest man alive. This podcast is one of the best there is. Theo brings an honest perspective mixed with a sharp wit to make for an engrossing and hilarious experience. Theo has a very unique look on life and the things in between which makes him interesting to say the least. He’s easily one of the top comics on the rise in the stand up.